Friday afternoon was hot here in PHX one of the hottest days on record. My son and I had just gotten home from California and some great beach time. I just wanted to relax and chill in the house. 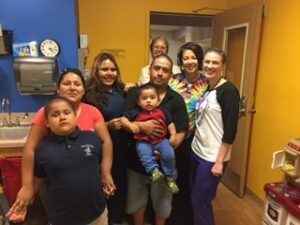 Lorraine from Comfy Cozy Chemo (one of our MG partners) had let us know of a family at Banner Hospital where their 7 year old son was fighting Leukemia. A loving family, hard working with 3 young children had been told at the beginning of their summer that they would spend it in the hospital with their son fighting for his life. We had eagerly agreed to help the family as Mom had to quit her job and camp at the hospital with her 7 year old and Dad was working full time to make ends meet. I was hot, tired and had car issues with my sons using our cars for after school activities and was stressing about getting to the hospital. My attitude was less than stellar as I contemplated if I really wanted another commitment on this day especially one that included driving in the heat. I was running late and by the time my son got my car home I didn’t get to the hospital until 4 keeping this family waiting in the hospital play room for over an hour. The oncology nurse, and Lorraine welcomed me with a big smile at the entrance of the hospital and took me to Henry’s room where the whole family was gathered with other hospital staff. Dad looked very worried, mom looked tired and kids looked like this was the last place they wanted to be, yet they were so gracious and patient with my tardiness. It hit me immediately that I was so fortunate and lucky to have the afternoon to be free to come and meet them. Free from hospitals, chemo, sickness, worry, sadness, etc. Seven years ago I was in their spot in the hospital fighting cancer and a very sick child as well. I was desperate for a day at the beach, a vacation free from stress, and just the normal day that comes with kids and their activities. Thank you Lord for these blessings that we sometimes curse, and remind us daily that their are families every day in crisis and all they need is a loving hand. This family has been fighting cancer for 3 months, no summer to speak of. I promised myself I would never forget what it felt like 7 years ago and I would be grateful and helpful wherever I could. ….Please reach out when you can in any way that you can…it means more to these families than you can possibly imagine! Posted in Blog on August 24th, 2015. We had an application last week for mom, “Kaye”. Kaye had her 2nd child in August. Kaye’s daughter was in the hospital the first time for 3 weeks after birth where she was dxed with a rare genetic disorder. She had surgery and they got to take her home. Three weeks later her daughter became very ill and they brought her back to the hospital and now have been there 8 weeks. Her baby daughter has had 4 surgeries, is being fed by tube and organs are not functioning properly. Kaye (mom) is a hair stylist she must work daily for the family income and there is no vacation pay etc. She has another daughter who is 2, so you can imagine her day; get up take care of 2 year old, go to work, listen to everyone else as she does their hair, then go straight to the hospital, head home at night exhausted and take care of the 2 year old again. Dad has his own business that has suffered during this time as he takes care of 2 year old and stays camped at the hospital. This morning when I spoke to Kaye she sighed heavily so many times! ( i recognized this sigh oh so well from my own experience and from speaking with moms who are trying to hold it all together) when I told her how we are going to help she broke down on the phone and cried and could not speak. I think as Moms we hold it all in until another Mother is there to quietly acknowledge and understand the overwhelming feelings! We will visit Kaye’s family tomorrow at the hospital and attempt to help them ease their burden this Holiday Season! As we spend our days preparing for Thanksgiving and all of the details of the holidays, I am so empathetic for these Moms who are holding the hands of their children in the hospital and trying to get through work and caring for their families simultaneously! As Moms we are truly the ones holding it together for so many and adding things like this to one’s plate is pushing the breaking point. Thank you so much from the bottom of my heart for your service to these Moms and to those of you that help every year….. you are the only way we can complete this work! God Bless you and your families this Holiday Season! Posted in Blog on November 25th, 2014. What is your reaction when you hear a traumatic story involving another Mom? Which stories do you hear and think “that is just too much”? Many times I listen, ask some questions, feel a tightening in my body, thinking to myself, I don’t even want to think about that scenario because I know I would collapse and not be able to handle the situation. Tori is a mom of two teenagers, one is special needs living with Asberger’s Sydrome. She is a full time employee at a public elementary school, her husband lost his job and had to relocate to another state to find work commuting back and forth. Some time into his new endeavor Tori’s husband decided to leave the family for another woman. While Tori suffered in silence and prepared to care for her family alone she started packing away her husband’s things in the attic and took a devastating fall fracturing her back. Upon leaving the hospital walking with a cane and beginning intense rehab, Tori prepared to return to work. As described by her nominating party she was in dire pain struggling to get through the day. She lost too much weight, lost sleep and became quite frail. Each day was overwhelming both financially and physically but Tori pushed on and handled her responsibilities. One morning after a couple of weeks back at work Tori was showering and found a lump in her breast. Yes, it was breast cancer and she would start treatment immediately. Now, put your self into Tori’s place, you have two children, a full time job, your husband left and is of no help financially, you break your back but have to get back to work only to now be diagnosed with cancer. I think about that scenario and I want to collapse! I think it is important as Mom’s for us to walk through these scenarios in our hearts when we hear them. Only then can we feel the real weight of the reality of their situation. Then, we can more easily think about how we can help in the NOW. There is a story like this in every one of our communities, it doesn’t have the same details but it is traumatic, overwhelming and we most likely don’t what to think about it because it makes us feel fearful and powerless! In many cases Moms are the backbone of the family and must carry on at all costs. Mother’s Grace is not there to solve long term problems we offer respite in a horrible storm, provide a deep breath while a plan is hatched. We want to lighten the burden when a Mom wants to collapse, so just maybe they can get up the next day feeling supported! God Bless Tori and her family! Posted in Blog on June 18th, 2014.